In the past, butter was churned by hand and housewives had to have it always ready for the household daily needs. In the Veneto region, where in the early 20thcentury food was scarce, butter was one of the ingredients of higher consumption, because it yielded a lot of energy. 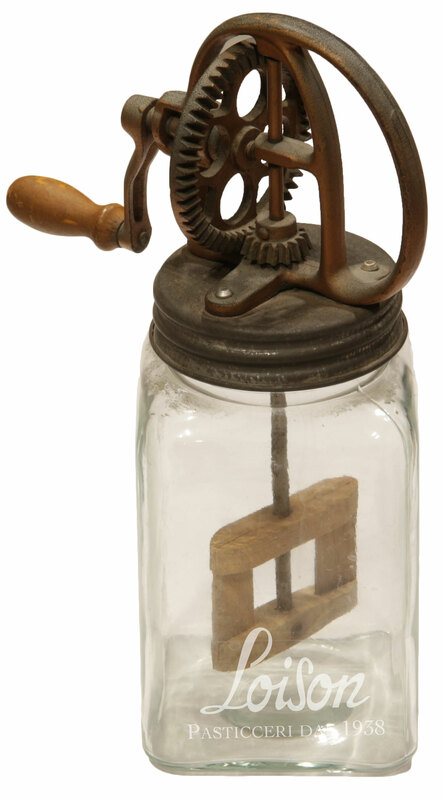 A forerunner of the machines now used in industrial dairies, this kitchen tool is a traditional hand-cranked churn. There were different types of churns, the most common being the vertical one used mainly by mountain dairy farmers. The glass jar holds 1 liter and features a metal shaft and a woodenpaddle. To this day, churning is still one of the stages of butter-making. Once the cream has surfaced, you would pour it into the glass jar and crank the handle vigorously to allow the fat to separate from the liquid part (whey). Then you would shape the butter into the standard form of a cubic or circular loaf, or press it into wooden molds.